your anniversary or any special event. West Hollywood is known for its young, trendy population and its vibrant nightlife. that has been serving authentic Italian food for nearly a decade. the pleasures of the table play out in unhurried celebration. clients to view a semi-open kitchen and a wood-burning stove. some celebrities that were having dinner. list, with a selection of popular labels that leans mostly Italian and mostly red. minerality that cuts through its rich, creamy backbone. array of pastas, wood-fired pizzas and meats. baked pizza can boast. It is rustic and comforting at once. Risotto al Funghi Porcini; crispy risotto cake, sautéed with porcini mushrooms. all enjoyed and shared all the delicious items we had that fabulous night. pie crust and inside succulent pieces of vongole (clams). Do not miss this out, it is a must! the sage. This is a dish that is both luxurious and decadent. a rustic homage to subtle flavors and quality ingredients. such as simple, elegant dish, yet one that resonates with subtle complexity. Beef, which is leaner, tastier, healthier and more tender. tart with custard and cream, and the Flourless Chocolate cake. 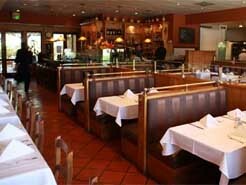 cuisine, there is no better spot in West Hollywood than Pane e Vino Trattoria.